According to the United Nations Environment Program, if current consumption and production patterns remain the same with a rising population by 2050, we will need three planets to sustain our way of living and consuming. Isn’t that alarming? If you care about your environment and what you pass down to your future generations then do your bit to give a meaningful definition on this World Environment Day 2015. Join the World Environment Day celebrations by Young Environmentalists Programme and Climate Reality here in Mumbai. Come promote the seed collection drives, tree identification trails and recycling jeans cloth bags projects. On Friday June 5th 4.30 pm, we will see you at Heritage Gardens in Powai, Mumbai filled with nature enthusiasts and citizens of various communities get together to salute planet earth. Young Environmentalists conducted a tree plantation drive to mark the World Environment Day. The Climate Reality Project India have a year long partnership with YES Bank helping them in their environmental activities on various occasions. As the whole world is gearing up for Environment Day. YES Bank is organizing the tree plantation drive on 5th June and spreading the green message to save the environment across the entire country. Elsie Gabriel environment educator with former VP of USA Al Gore promoting climate change education. The Climate Reality Project is a non-profit organization involved in education and advocacy related to climate change. The project was established in July 2011 after the joining of two environmental groups, The Alliance for Climate Protection and The Climate Project, which were both founded in 2006 by Al Gore. 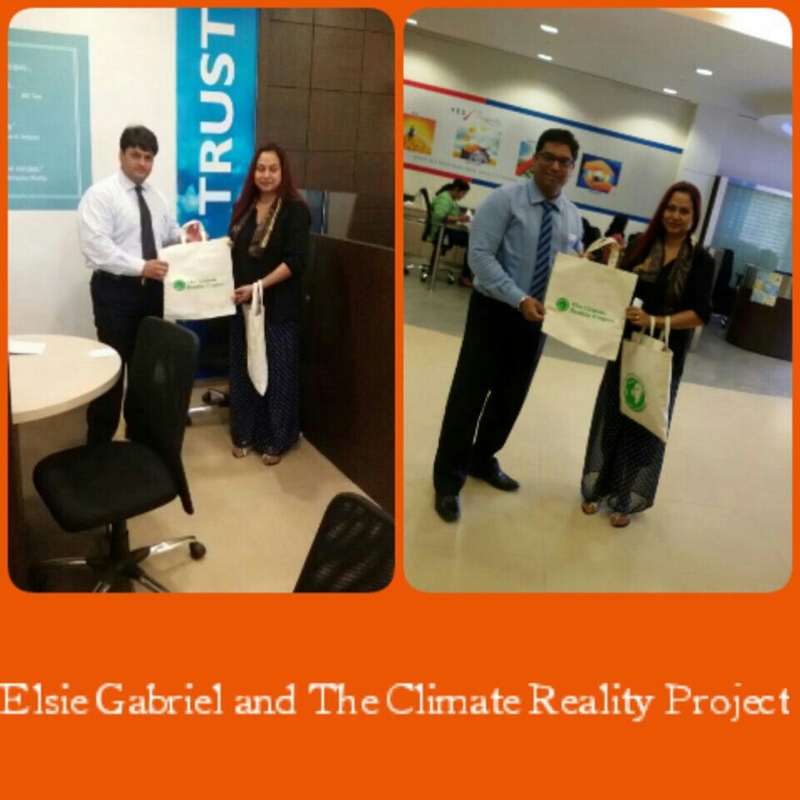 Elsie Gabriel Mentor of Climate Reality teaches climate change education in schools and colleges in Mumbai. Says Elsie, “We teach free of cost and want more schools and teachers to join our programmes. We want the subject of EVS in environment science to be re-instated as main stream subject in schools curriculum, why has it been discarded, with so many disasters and civic problems we need the subject. The future generation can be better equipped to fight climate change. It is our duty to pass down a planet which is intact. We invite all of you to come join our Climate Reality projects.” This Friday, June 5, is World Environment Day (WED) which celebrates positive environmental action and calls on each of us to create change. The theme of WED—“Seven Billion Dreams. One Planet. Consume with Care”— reminds us that we only have one planet, and that the Earth’s natural resources are finite, not unlimited. As we do our bit, we expect you to turn up in huge numbers and get connected for a noble cause.